By administrator in IMC Exploration Group (IMCP) on 22nd January 2016 . Pt 12 – Where is the Gold in Wicklow’s Goldmine River district? Where is the gold in the Goldmine River district? This was well illustrated on a map published in 1971 by Tom Reeves, a professional geologist by training, but better known to Irish consumers, until his recent retirement, as the Commissioner for Energy Regulation. 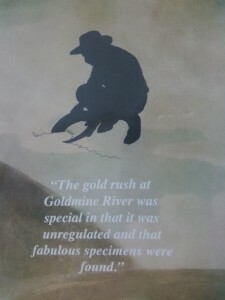 The main focus of placer gold was along the Goldmine River itself, downstream of Ballinagore Bridge and there are additional occurrences reported from the stream at Knockmiller further east, here called the Eastern Goldmine River. These occur both east and ESE of the Ballycoog-Moneyteige ridge. There are further showings along the Coolbawn River wich flows northwest from Croghan Kinshelagh towards Annacurragh as well as along the Aughrim River and its tributaries immediately north and ENE of the Ballycoog-Moneyteige ridge. Further away, and less directly relevant to our story, are gold placer occurrences along the Avoca and Ow Rivers. The occurrences, as well as bedrock gold, all occur in close association with the outline of the zone of volcanic rocks which extends from Avoca district. Yes, even in 1801 Fraser really did get it right: there is indeed a link between volcanic bedrock and placer gold in this area. We have an accurate knowledge of the extent of the original gold workings in the Goldmine River area because Thomas Harding, Surveyor, and his assistant undertook an arduous survey of the river, its tributaries and surrounding mountainous terrain. Harding was an accomplished and successful surveyor, residing on Prussia Street in Dublin, but he had to share the credit for his labours with several others. The resulting Mineralogical Map, published in December 1801, gives a fascinating insight into the extent of alluvial gold and workings, as well as the old (even then!) mine workings on Ballycoog-Moneyteige ridge. But then this was no ordinary map, being executed by command of His Excellency, Philip Earl of Hardwicke, Lord Lieutenant General and General Governor of Ireland. It was done under the direction of Richard Kirwan, who was Inspector General of Mines, and the Directors of His Majesty’s Goldmine: Abraham Mills, Thomas King and Thomas Weaver. 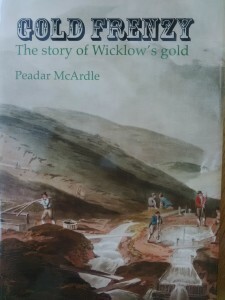 Kirwan had visited its location back in 1796 and now, five years later, it was being published. It was certainly a good basis for presenting the new exploration strategy being proposed by the directors. It may have been intended for official eyes only – uneducated peasants could not be expected to glean much information from such a technical document. But then they wouldn’t have desired it either, all they would have wanted was free access to the workings again!